It measures 3.5cm x 2.5cm, and it's made of two layers of glass. 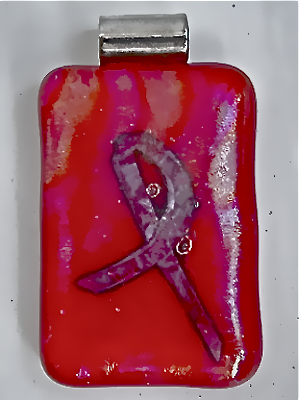 A layer of bright Red opaque glass with a layer of clear Dichroic glass with a rainbow effect. Between these two layers there is a piece of copper sheeting in an abstract design.